Reonomy’s national platform blends analytics with an adaptive intelligence engine to provide powerful data and research solutions for commercial real estate. The revolutionary platform is a single source for CRE property data, saving brokers, investors, and other CRE professionals hours of data research. Identify and evaluate new opportunities for investment using Reonomy. The program takes complex data and transforms it into accessible information. The search engine validates property ownership data, property characteristics, and relevant financial information for multi-family buildings. The canvassing and sourcing tool helps clients find comparable buildings quickly to evaluate potential opportunities. Users add notes to help stay organized while searching key data. Reonomy’s powerful analytics tool helps developers find comparable buildings from over 40 million properties. Reonomy is designed for commercial real estate professionals in multi-family, office, retail, and industrial spaces. Currently in beta, users can request early access to the software on their website. Right now Reonomy is currently available for New York City with plans to launch nationally in Q2 of 2017. Visit Reonomy on its website or connect socially on Twitter. Join the Reonomy early access waitlist. 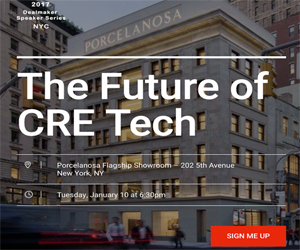 Older PostThis CRE Tech Cycle is Ending!